+ Easy updateable EFI. Changes to the configs can be made out of your favorite OS via text-editor. (+) You can have a Hackintosh (Don't ask me for support on this, I never intended to have one, I'm just using the EFI-Loader + NVMExpress.efi driver. NOTE to Legacy BIOS users: I didn't try a Legacy BIOS installation yet, so the steps for you are just theoretical. Feedback is welcome and needed! - Alternatively you can also use a SATA-device, but I won't cover the installation to a internal harddisk/SSD in this guide, as I like the concept of a seperate USB-flash for the Clover-EFI bootloader. It's easily replaceable and fastforward to install. You also don't have to worry about data-loss when updating it. If your legacy BIOS does not support USB-boot, then you shouldn't stick in a PCIe SSD into your machine anyways... A good reason to install it to a SATA-device might be, that you don't have any USB-ports left or if you are using a notebook (I don't consider sticking out USB-drives as a permanent and convenient solution). But check first if you have a cardreader, especially when you own a notebook. In BDU, you still have to enable the listing of internal, fixed disks first. Keep in mind that this installer will wipe the selected disk completely, so backup your data beforehand. If you find another way to install it without endangering the whole disk, just tell me. I will add it as an alternative option to my guide. - Your PCIe SSD should be installed into your machine. Insert the USB flash drive or SD-card into your machine. Softly click on "Format Disk" and wait for the magic. Access your Cloverstick via Explorer. NOTE to Legacy BIOS users: In case that it won't work like this, copy it to both folders. I can't tell you if it will work like described. You can check if the driver is loaded properly by opening the Clover-EFI-Shell and just typing "drivers". It should be listed at the very end. Edit \EFI\CLOVER\config.plist with your favorite Editor. to something lower, like 1-3 seconds. Just change the number. Reboot your machine and enter your BIOS/UEFI. Legacy BIOS: Change your bootorder. Setup the freshly created stick as primary boot device. UEFI: If possible, disable CSM or change the Storage Oprom to "UEFI only". Change your bootorder. Setup the freshly created stick as primary boot device. 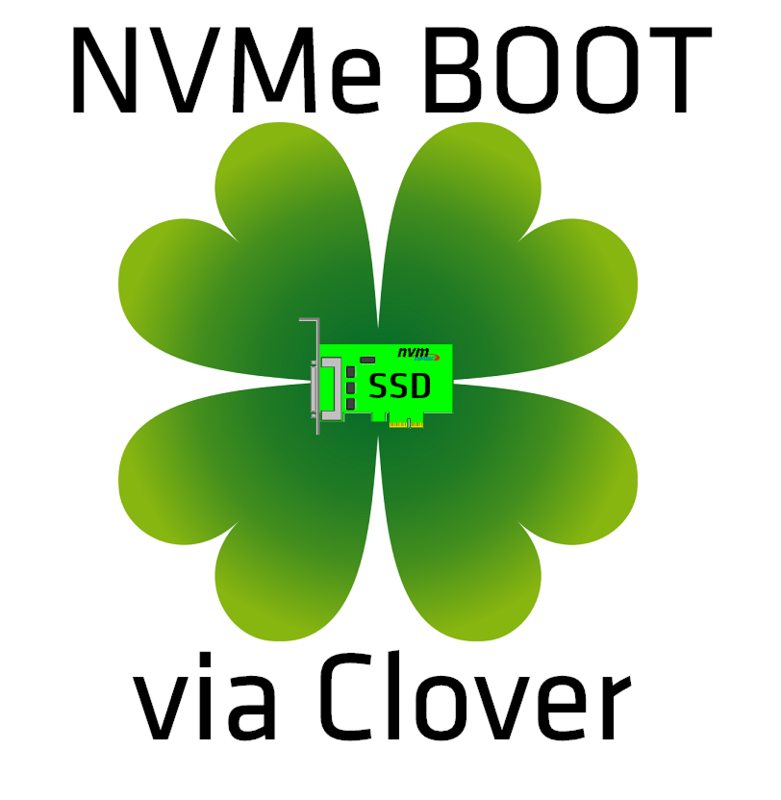 Boot into the Clover-EFI bootloader. Continue with your Windows setup and delete all partitions on your NVMe-drive. Install Windows to your drive as usual. Wait for the installer to finish. If you followed the guide correctly, the Clover-EFI bootloader should detect your Windows installation and boot from it. Install your drivers and tweak your Windows as you wish and don't forget your vendors NVMe driver for highest performance! This guide is still work in progress! Credits go to the Clover-Team! Thank you for saving my new SSD. I'm looking for the NVME booting solution couple weeks. Now, the Sony VAIO laptop can boot from the Clover USB and recognize the NVME drive for further OS loading. Thank you very much for having written and published this extremely useful guide at Win-RAID Forum! You obviously have done a great job - congratulations! It is great, that booting off a PCIe/M.2 connected NVMe SSD now seems possible for nearly everyone with an old computer and a LEGACY BIOS, that means without the ability to boot in UEFI mode. Big additional advantage: This method does not require any BIOS modding! Welcome at Win-RAID Forum and thanks for your feedback! Enjoy booting off your NVMe SSD with a natively not supported hardware configuration. I'm happy to this forum. Finally I can contribute some small amount of wisdom back to this forum. It helped me so many times! Really glad it works for you! Maybe use a SD-Card or SATA-device. I mean it works with Cvads BDU, but just be careful when creating the EFI-partition. I met BSOD on Win 8.1 and Win 10, even use the Sony Care to restore to factory default or re-install Win 10. Sometimes I fail on logon or file copy but the CrystalDiskInfo shows the S.M.A.R.T status is good. The cpu fan is loudly but CPU temp. is not too hot(50~60 degree C). Finally, I have no idea and decide to purchase a Intel 600P 256G M.2. To solve the BSOD maybe and upgrade the SSD capacity. I used Rufus to create an UEFI Win10 1607 USB for installation. I can see the Intel 600P 256G SSD during the install selection. It looks ok and finish the file copy process. But it doesn't boot after first time boot. I tried to google the reason why not booting and leraned about Samsung XP941 is supported by SVP132 BIOS but Intel 600P is not. Meanwhile, I have misunderstanding the root cause and try to find the NVME support via another boot loader GRUB2 but no luck. Then I found many discussion about the BIOS NVME mod especially Win-RAID. But I have no courage to update the VAIO bios right away. So, I figured 3 solutions. I tried 1st solution about 1 week till today. It's not too bad, but sometimes slow moving on the USB drive. Now is 2nd solution and it works very well. 2. Try to find the GRUB2 with NVME support. It's wrong. The root cause is BIOS not bootloader. I also referred to a discussion about the Tianocore - open source UEFI. But it's a little hard to understand the usage. I made a USB with tianocore and boot up while the bios set to legacy. But I didn't find the NVME device in the Boot list and PCI device list. I think about where to load the NVME driver in tianocore UEFI? At the same time, my colleague found some discussions about the NVME support by Clover. Weird, then your BIOS/UEFI probably got whitelisted hardware. Clover is based on Tianocore by the way. Tried it aswell with Tianocore first and failed. It seems, that it's not developed actively anymore. after hours of fiddling and studying Clover, Tianocore, DUET, UEFI, UEFI Shell, Windows Boot loader internals, other tutorial on this, etc... I am reporting !!! SUCCESS ON BOOTABLE NVME UNDER WINDOWS 8.1 PRO on my 8+ years old ASUS P6T SE, Core i7 920 with SAMSUNG SM961 256GB !!! I will not post the exact steps I did to get this working right now, still want to try and document another ways (i.e. clone my old Intel Raid-0 system and try different bootloaders), but I'll write very detailed and easy-to-use tutorial in the coming days (weeks?) as my time permits. It is really great, that you succeeded to get the brandnew Samsung SM961 NVMe SSD booting with your old Intel X58/ICH10R system. I'll write very detailed and easy-to-use tutorial in the coming days (weeks?) as my time permits. I got the process to work and my Dell Precision 5510 is running Win 10 x64 Enterprise with a 512gb Samsung SM951 without any problems, but performance is average, at best. The only thing I can think of is that at one point, I put the NvmExpressDxe-64.efi in both the drivers64 and drivers64UEFI folder (step 3a) and left it in drivers64 before I figured out the sequence (didn't write it down). Could Windows be running in Legacy mode? I read the internet for hours last night and found that Clover is quite configurable and can update easily (if you have a Mac). What I couldn't find is how to use the Clover boot drive used here to update the bootloader (correct term?). I'm hoping I can simply remove NvmExpressDxe-64.efi from the drivers folder re-create the bootloader without doing a full wipe of the drive and re-installing Windows? Here's a screenshot of my drivers, benchmark, and something I thought was interesting from Samsung Magician: it shows the SM951, but I think it's just reading some metadata from Windows. I don't think it fully recognizes there is a Samsung SM951 there because the only function available is performance benchmark (which it will do for any drive). You succeeded by following this guide or which bootloader did you use? I'm little bit confused, because you are writing about multiple ones. You want to write your own tutorial specifically for your board or legacy BIOSes in common? If you want, we can add an universal addition to my guide. That's the problem with Clover. It's made for Hackintosh purposes, so you'll find most tools only for OS X. You want to update your Clover-EFI? On what media did you install it? Flash or SATA SSD/HDD? I used a USB flash drive with Clover in one USB 3.0 port and Win 10 Ult x64 (rufus iso) on another USB flash drive in another USB 3.0 port. I did a clean install after I posted with the file in the drivers64UEFI folder only, so my install is now clean. However, knowing how to update the bootloader&nbsp;using usb flash / Clover would be great in case there is a newer version of the NvmExpressDxe-64.efi file is produced some day. I mention this specific use case because I noticed in one of the other NVMe boot threads (forget where I read it when I was trying to figure this out on my own) that a newer NvmExpressDxe.efi file was being used, but it didn't have "64" in the name, so I assumed the file provided in this guide was better for a 64bit OS, even though older (Fernando often points out that newer isn't necessarily better). Edit: 12/12: A new NvmExpressDxe-64.efi!!! Fantastic.&nbsp;I'll wait until prices for the 960 Pro (1gb) to come down to start fresh or someone posts how to update the bootloader through Clover with this new file. I took the time to read the referenced thread and it and other well-documented guides, are oriented towards modifying a mobo bios module.&nbsp;My $$ Dell laptop is still under warranty and I'm not about to&nbsp;even try to touch it's&nbsp;bios.&nbsp;The Clover bootloader&nbsp;process is&nbsp;the perfect solution, so I'll wait for a kind person to document how to update. Even with the original NvmExpressDxe-64.efi file, I'm faster than stock. p.s. Donation to Fernando sent - your effort to help so many is to be commended! However, knowing how to update the bootloader using usb flash / Clover would be great in case there is a newer version of the NvmExpressDxe-64.efi file is produced some day. What we have here is an NvmExpressDxe-64-3773.efi file dated 09/28/2016. It had been compiled by the Clover Team and was posted >here< by our Forum member davidm71. By the way: A new Module won't make your drive faster. As soon as Windows boots, you are using the standard microsoft windows nvme driver or the windows-driver from your nvme vendor. The the Clover nvme-driver is just there to make your drive bootable, because your bios/uefi doesn't support nvme. pci bifurcation via software? » « How to get an Intel 760p working as a storage only drive on Z68?